Publisher: CIHM/ICMH Microfiche series = CIHM/ICMH collection de microfiches -- no. 11348, CIHM/ICMH microfiche series -- no. 11348. "CIHM/ICMH Microfiche series = CIHM/ICMH collection de microfiches -- no. 11348, CIHM/ICMH microfiche series -- no. 11348" serie. Download more by: National Council Of Women Of Canada. 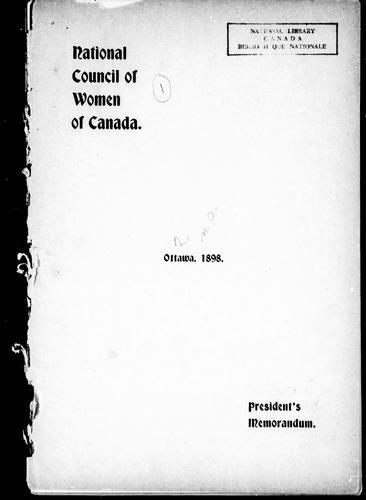 The Get Book Club service executes searching for the e-book "President’s memorandum of the business transacted at the fifth annual meeting of the National Council of Women of Canada, held at Ottawa, May 16th, 17th, 18th, 19th, 20th and 21st, 1898" to provide you with the opportunity to download it for free. Click the appropriate button to start searching the book to get it in the format you are interested in.